By now many of you have at least heard about the RC5 Challenge wherein a process referred to as "Distributed Computing" is used to attempt a brute-force attack on an encrypted message. A message has been encrypted and placed on a server. Users all over the world download the Client software which, in turn, downloads key blocks from the server and attempts to crack the encryption to read the message by trying all of the possible keys. The general purpose behind this effort is to show that files, messages and Internet sites are not safe when an encryption key less than 128 bytes is used to protect the files or the site. While it's results are not yet known, one thing it has succeeded in doing is proving the usefulness of "Distributed Computing". Now, the concept of Distributed Computing has found another use. A use based on real scientific research, and a use that anyone can be a part of. Those of you who saw the movie "Contact" know the basics of how it works. Scientists using large (or HUGE) Radio Telescopes scan the skies in the hopes of finding a faint radio signal that just might have originated from a civilization outside our own Solar System. We here on Earth have been beaming radio and TV signals into space for 50 or so years, both inadvertently and on purpose. The signals travel at the speed of light, so by now some of them may have traveled 50 light years into space. Assuming that there exists intelligent life in outer space, and that a civilization exists within 25 light years of Earth, their own scientists may have received a radio signal from Earth. Could they have attempted to contact us? If so, their signals may just now be reaching us. Who's listening for them and how would they know when they found a real radio signal that's mixed in with all that static noise? Considering the vast distances traveled, scientists believe that it's more likely that any signal reaching Earth from outside our own solar system would be signals in the Microwave bands. High powered, focused signals similar to the TV, Radio and Telephone signals bounced from Earth to satellites and back to Earth again. So, what does all this have to do with Distributed Computing and OS/2 you ask? Well, SETI has recently begun a project called SETI@home. SETI observers, using the HUGE Radio Telescope in Arecibo, Puerto Rico have been scanning the skies and recording all of the signals that they receive. Most of the noise in the signal is from the galactic background and the Earth's atmosphere. However, hidden in all this static just might be a faint radio transmission from outside our own solar system. If such a transmission were found, it would be proof that intelligent life exists on other planets. All of the recordings done at Arecibo are digitized and split into blocks referred to as "Work Units". 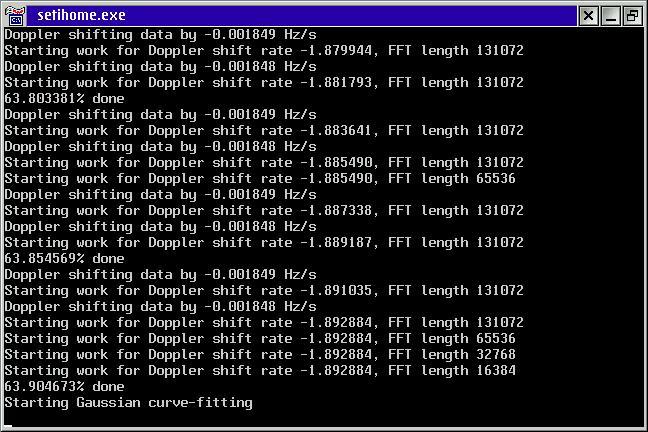 Computer users all over the world have downloaded and installed the SETI@home Client Software which allows them to connect, via the Internet, to the SETI servers at Berkeley. The Client software will download 1 "Work Unit" and the software will go about analyzing the signals in that Work Unit. Any anomalies found by the software are recorded in a file on the users computer. When the client has finished analyzing that Work Unit, the software automatically connects to the SETI server and uploads the Results. Once this is done, it downloads another Work Unit and starts all over again. Any anomaly sent back to SETI will be further checked by SETI scientists. If the users computer is not connected to the Internet when the Client is ready to send, the client simply waits 1 hour and tries again. It will wait and retry continuously until it succeeds. In the most basic terms, it's a "Brute Force Attack" on seemingly endless streams of Radio Transmissions from Outer Space. Originally, the Client software was developed for Unix (and Unix variants including Linux), Windows and MAC Operating Systems. The Unix version, command line only, has been available for about 2 weeks, as of this writing (4 weeks as of publication). Windows and MAC versions run as Screen Savers. All versions run as Background Tasks, so, like the RC5 clients, only use CPU cycles that are otherwise unused. Thanks to the efforts of Dr. Dirk Terrell, along with Christoph Schulte Moenting and Anders Jarnberg, an OS/2 port of the Unix Command Line version is being developed. As of this writing, I am running the 1st beta on two OS/2 machines at home. By the time you read this, the command line version will be publicly available and a PM version has already been started, but as yet no date for when it will be available. here is a screenshot of the PM interface. Setup of the Client is fairly straightforward and mostly automated. It does require that the EMX Runtime be installed on your OS/2 system, but the runtime package and installation instructions are available along with the distribution of the client. Once you have the package installed, simply run the setihome.exe file. As it will be the first time you run it, the client will automatically connect to the SETI server and offer you 2 options. Option 1 allows you to login as a new user. Choose this option, and you'll be led through a series of questions. An e-mail address is required, as well as choosing your Country, Postal Code and location (Home, Work or School). Once you've completed the setup, the Client will download your first Work Unit and start processing it immediately. Several files will be created in the directory where you have installed the client that keep track of where in the Work Unit the processing currently is as well as a results file and several others used for administrative tasks. Option 2 allows you to login to a previously setup account. You shouldn't have to use this option too often. As stated earlier, the Client will automatically connect to the SETI server when it has completed a "Work Unit" and is ready to send the results and download another "Work Unit". If you use a Dial-Up Internet connection, and are not online when this occurs, the Client will simply wait for 1 hour and try again. This will continue, indefinitely, until it connects and transfers the data. ellie01.zip is the filename, text files and a screenshot are also available from that URL. If you are using the Injoy Dialer to connect to your ISP, and have registered the "Extended" version, you can simply enable DOD (Dial-On-Demand) and the Client will trigger the DOD and Injoy will dial up your ISP so that the Client can complete the data transfers in a timely manner. I have a small LAN setup at home, with 2 OS/2 Warp 4 machines and a Linux machine all connected with TCP/IP. One of the Warp boxes has the Injoy Dialer (Extended version) setup for DOD and NAT (Network Address Translation). NAT allows the other 2 machines on the LAN to share the Internet connection established by the machine running Injoy. Both of the Warp boxes are running the OS/2 Command Line Client. The Linux box is running the Linux Command Line Client. When one of the Clients has completed processing it's "Work Unit", it attempts to send the results to the SETI server. This, in turn, triggers the DOD on the OS/2 box running Injoy, a connection to my ISP is established, and the data is transferred. The Client then sets about doing its job, analyzing another "Work Unit" of data. For more information on SETI, and how you can help support their efforts by becoming a member of Team SETI - https://www.seti.org/teamseti.html, check out the SETI Website - http://www.seti-inst.edu/. 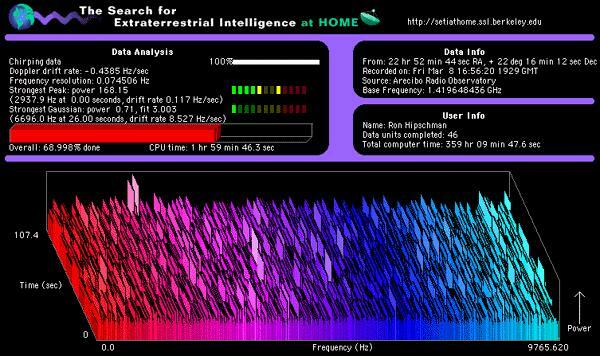 For more information on SETI@home - http://setiathome.ssl.berkeley.edu, click on this link. You'll find links to a FAQ, detailed information on the project, download links for the Windows, MAC and Linux versions (the OS/2 version should be available by the time this is published) and Statistics. These stats are grouped in several different categories including "by OS" for those of you who want to "keep score" against other Operating Systems. There is a BeOS version in development, but I have no information on that port. By participating in this project (expected to run for about 3 years), you will be assisting in real scientific research and you just might be a part of what could conceivably be the most important discovery known to mankind. All it takes is an Internet Connection, a few minutes to download and setup the Client and any "spare" CPU cycles you might have "lying about". SETI@home has recently instituted a Group or "Team" concept wherein you can join a team, and your statistics (number of Work Units downloaded, number of Results sent and CPU time used) are credited to the Team. Timur Tabi has formed a team named, aptly enough, "OS/2 Warp". If you have downloaded and setup a Client to run the SETI@home project, you can join "OS/2 Warp" by pointing your browser to Team OS/2 Warp - http://setiathome.ssl.berkeley.edu/stats/team/team_1331.html . Click on the link to "Join This Group" and fill out the webform. If you don't know your password, simply click on the link on the form page, enter the e-mail address you logged into SETI@home with, and a password will be immediately e-mailed to you. This project has, so far, exceeded SETI's wildest dreams. As of May 25th, there were over 350,000 users downloading data and analyzing it. Unfortunately, this has caused a lot of problems due to insufficient server capabilities. By the time you read this, server bandwidth will have been increased, and these connection problems should no longer exist, at least not at the level they were during the 3rd week in May. Also, a new version of the client may be released by the time you read this (everything in this industry moves at Warp speed, these days) to address some bugs found when the clients went public (this applies to all versions). Join Team OS/2 Warp, and add your CPU cycles to the cause.